Update: This plan may not be “watered down” after all. See our follow-up report here. Planners are touting a new proposed configuration for Geary Bus Rapid Transit that would forgo bus passing lanes in order to preserve car parking to appease merchants. Separated, center-median bus lanes would be retained, and project backers hope the changes will clear the way for implementation, but the loss of the passing lanes means buses won’t be able to operate as quickly. The proposal comes despite a recent survey from the SF County Transportation Authority showing that Geary merchants vastly overestimate how many of their customers drive, and that their priorities on transportation are out of line with those of their customers. 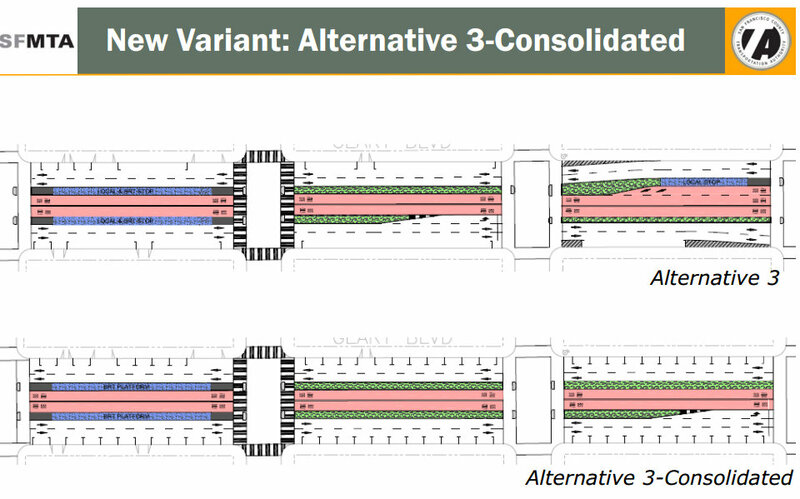 The new proposal [PDF], called “Alternative 3 Consolidated,” would run buses in two center lanes between dual medians. But unlike the original Alternative 3, it wouldn’t include passing lanes at stops that allow express BRT buses to pass local buses. Instead, the proposal would include only one “medium” bus service in which stops would be closer together than typical BRT, “but more spaced out compared to the local,” said David Parisi, a consultant working on the project for the SFCTA. Eliminating the passing lanes would free up space to preserve car parking on Geary, in a bid to appease local merchants. By converting parallel parking spaces on side streets to angled parking, Parisi said all of the parking that would be removed for BRT improvements could be replaced. The proposal is being championed by D1 Supervisor Eric Mar as a way to expedite the project, which he said has “been dragging” since its conception at least a decade ago. Mar, along with Supervisors Scott Wiener, David Chiu, and David Campos, grilled SFCTA staffers on the snail’s pace of the city’s BRT projects on Geary and Van Ness at a board meeting last week. Mar joined San Francisco officials and transportation advocates on a trip to Mexico City in May to tour the city’s BRT system, which was built at a far faster clip than San Francisco’s projects. “I saw how BRTs connect the transit system with underserved areas that rail or subways don’t reach,” said Mar. Under the original Alternative 3 proposal with passing lanes, 15 to 20 percent of parking would be removed on Geary between Palm and 25th Avenues. The consolidated Alternative 3 plan, without passing lanes, could result in “net zero” parking loss on or near the street, according to Parisi. In fact, he told an audience at a town hall meeting yesterday that a “net gain” in parking is possible, though when Streetsblog later asked him how that would further the city’s policy goals of increasing the use of walking, transit, and bicycling, he denied that it was under consideration. 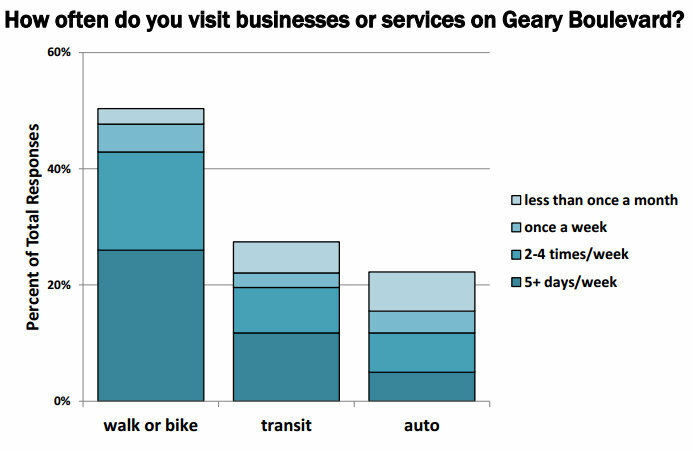 Geary merchants believe that 54 percent of their customers arrive by car, though the actual number is 22 percent, according to a recent SFCTA survey [PDF 1, 2] of 569 businesses on Geary and 295 businesses on Clement Street. 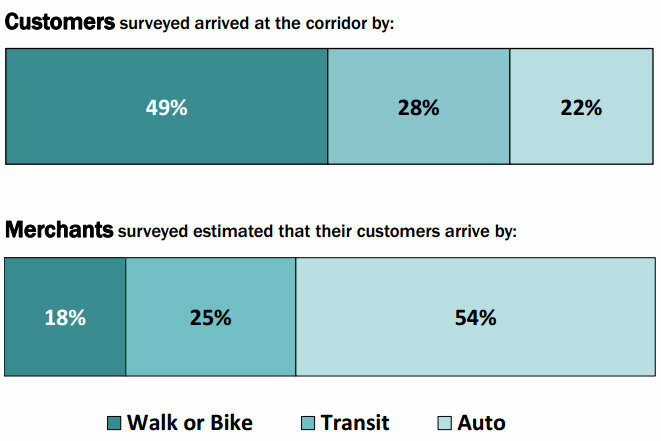 Additionally, shoppers who arrived without cars visited businesses more frequently than those who arrived by car. The findings are in line with surveys done on Polk Street, Columbus Avenue, and other shopping districts in dense urban areas. 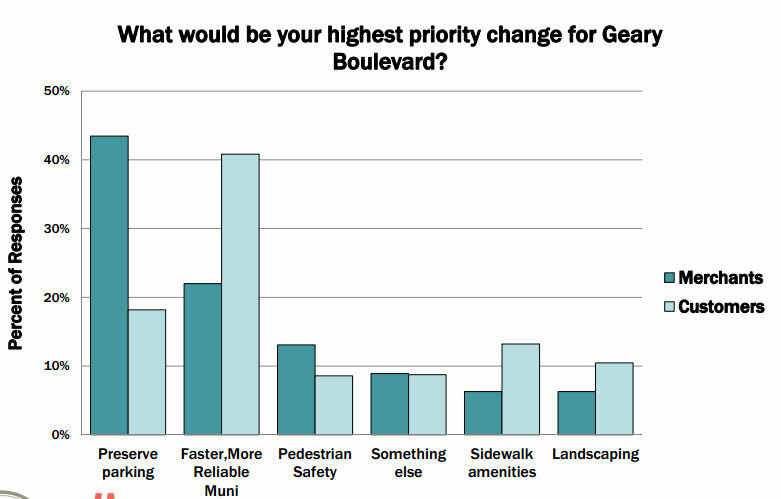 The SFCTA survey also found that when it comes to preserving car parking or improving transit, merchants have a poor sense of how their customers would respond to changes. 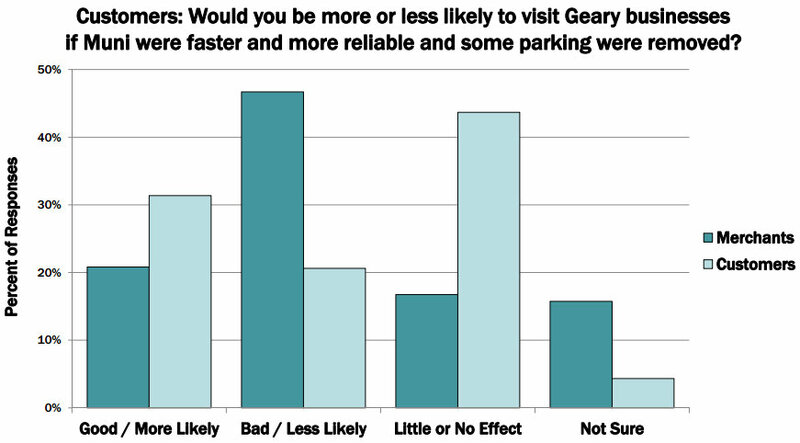 More than 30 percent of customers said they could be more likely to visit businesses on Geary if parking were removed to enable transit improvements, compared to about 20 percent of customers who said it would make them less likely to visit. Meanwhile, about 45 percent of merchants believed removing parking to enhance transit would hurt their business. Improving Muni service was the top priority for over 40 percent of customers, while preserving parking was the top priority for almost 45 percent of merchants. When Parisi presented the SFCTA’s survey data at the town hall yesterday, David Heller of the Geary Merchants Association interrupted him to claim that between himself and 35 other merchants he spoke with, only one had been contacted for the survey. The SFCTA says surveyors visited every business on Geary and Clement at least twice. Heller, who owns a shop on Geary called Beauty Network, told Streetsblog that he simply didn’t believe the survey results and accused the surveyors of asking misleading questions. “I don’t buy it. I really don’t,” he said. Aside from parking loss, many merchants seem to fear losing business during the project’s construction. Heller said merchants on Third Street and West Portal Avenue suffered due to extensive construction on those streets in recent years. Parisi pointed out that construction for BRT is generally much less intensive than that of light-rail projects like the T-Third. Instead of building BRT, Heller said Muni should focus on internal reforms and discipline its “abusive drivers” before re-designing streets to speed up the system’s busiest bus line. “You wanna fix Muni, you got to clean your home first, and then you go outside,” he said. During the planning of Geary BRT, planners said they’re looking to make near-term improvements on the downtown section of the corridor east of Gough, which has faintly-marked bus lanes which are routinely violated by drivers. Parisi didn’t specify which improvements would be made, but said they could be in place before Geary BRT’s environmental impact report is completed. Although the SFCTA had considered placing BRT stops just outside the tunnel at Masonic Avenue, planners said that option is no longer being seriously considered as part of the BRT project, citing high costs. That means Geary BRT buses will have to merge from the center-running lanes out the side-running lanes which run up to the Masonic overpass, then back to the center again, but planners say it would also maintain stops closer to nearby businesses like Trader Joe’s and the Target store set to open at the intersection. The Fillmore Street underpass, however, is still being considered for a fill-in. As the SF Examiner reported last week, Supervisors Mar and London Breed called for a hearing on the feasibility of that project, which would help re-connect the Japantown and Fillmore neighborhoods at an estimated cost of $40 million. The research conducted the MTA for the BRT is completely false. The MTA refused to conduct an economic impact report because they know the results would grossly contradict their own ‘research’. The fact is the BRT and the redzone lanes that already exist on Mission Street will only harm local businesses. And most local businesses do not have parking lots. If you want Geary to turn into another downtown Oakland, ignore the businesses and see what happens. Increased business closures, more homeless, graffitti, and all for 4 minute wait bus wait time? We already have 4 minute bus wait times! And as for the promised up to 20 minutes of commute timesavings, how is this even possible? Going from one end to the other on a non-express bus takes over 30 minutes. How can you shave off up to 20 minutes unless it is underground transit? Shakes my head. Some of these ideas from the MTA for the BRT completely disregard reality. These timesavings are under IDEAL conditions. Even retired engineers who worked for the MTA stated on record the BRT will not deliver the proposed timesavings. Prove it. Where is your data? It sped up the trips for tens of thousands of people that take that Mission bus. And then, perhaps more people could get to Geary if there was a faster way to get there. I live off of Dolores and almost never go to Geary, it’s too far on the bus. Maybe if I happen to bike there. You are entitled to your opinions, you are not entitled to your own facts. I know that you really believe what you say, if you have actual proof instead of allegations from the loudest people perhaps someone would listen. Research the data on what is happening on Mission Street businesses first, have you done that? The City refused to conduct an economic impact report (requested by both residents and businesses). A project of this magnitude(receiving Federal funding in the multi-millions) along the largest transit corridor should prudently examine how the proposed project actual impacts all areas, not just the environmental impact. You ask for proof, well I ask the same of you. You claim businesses along the Mission Street are not negatively impacted. How many businesses have you interviewed? What did they say? Have you studied how accident have actually increased since the redlanes were painted? As for the Geary BRT, did you know the MTA claims new wait times on the Geary 38 lines of four minutes? Well that IS the current wait time, today, even during rush hour. Also, have you looked at what is happening on Geary as parking is being removed to put in sidewalk bulbs and redlanes? Did you know the existing residents, visitors, and patrons all end up parking on the adjacent streets? Probably not your concern since you take MTA. But consider this what will happen once the Geary BRT construction starts? Three lanes on each side will be reduced at best into two lanes, and at worst all into one lane! It does not take an engineer to understand the fallout will not benefit the community. More importantly, in neither of these situations does the MTA BRT project even address the numerous consequences adversely impacting the environment, elderly, children, pedestrians, residents, visitors, and lastly, businesses. On that matter, you may not care what happens to businesses, but the fact is there are hundreds of small businesses, restaurants, and a wide variety of professional services (medical, dentistry, automotive, construction, finance, legal, just to name a few) employ people along the Geary corridor. How long do you think a business can last when construction runs for years? Do you really believe businesses will not be negatively impacted? It is just a matter of time before businesses cannot sustain their overhead and will close down. Want further proof examine what happened with the Stockton MTA underground project, it is taking far longer than projected. You may say but that is underground, it is not the same. True it is underground but name one project in SF since the 1970s that completed on-time and without exceeding the budget. The Geary BRT project will go over budget and take longer than four years. Communities, the residents of all ages, and the businesses that employ people in this area will all be negatively impacted. No one in City Hall in the Board of Supervisors to the MTA BRT team carefully thought out the Geary BRT project, because when all is said and done, this project is nothing more than social engineering, done not to increase transit times or promote safety; in reality, the real goal is to “displace vehicles” along Geary. Sadly that goal will never happen especially since there are car sharing businesses like Lyft and Uber. If “the data” you refer to exists, produce it. Anecdotes are not data. You should be asking and demanding the MTA to provide the data you seek. They are the ones who are forcing all San Franciscans to pay the $300 million bill plus the $50 million each additional year the BRT project extends. Basing the approval of a $300 million project that provides unsubstantiated improvements is asinine. Since you love data, you should make time to read the limited/bias data provided by the MTA on the project time savings for the BRT and the project costs. Read it first and then comment b/c you clearly do not understand their projections (based on 2030 estimate) are currently achieved using the existing system. You’ve changed the topic. The topic was data supporting your claim that the red paint on Mission Street has hurt business. There is no credible data for that, your claim remains unsupported. As for what you changed the topic to, I actually agree that the projections for Geary BRT are uninspiring (though they aren’t data). To me this shows that what we really need is a less-compromised transit system, such as a restoration of light rail on that corridor.